Cardiff City boss Russell Slade acknowledges he still has a lot of work to do with the Championship side. Slade was appointed in October in place of Ole Gunnar Solskjaer, who stepped down after a poor start to the season. The Bluebirds have not won in three games and although 11th in the table Slade says his side are a work in progress. "When I picked the team up they were 17th in the table and drained of confidence," he said. "[There] were all sorts of issues from fitness to game plan issues and we're trying to fix that. "But along that journey of fixing that, there's still going to be sideway steps before we go on and attempt to progress again." Cardiff have not won since a 1-0 victory at Watford on 29 November and lost their first home game under Slade against Brentford last Saturday. Slade apologised to fans for his side's first half display in the 3-2 defeat, describing the loss as "annoying" despite a fightback by his side after the break. The Bluebirds travel to Charlton Athletic on Boxing Day hoping to bring a three game winless run to an end and to secure only their second away win of the campaign. Former Notts County and Yeovil manager Slade admits he is frustrated with recent results and hopes for an instant response from his players at the Valley. 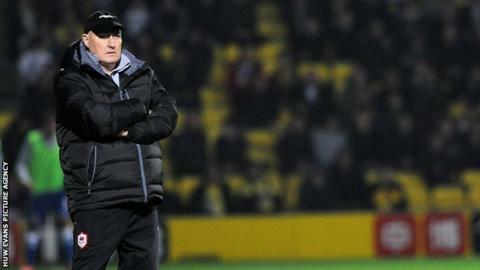 "There's always another game and particularly over the Christmas period," Slade said. "There's always one coming up fairly quickly." "But I'll be honest I'm a little bit frustrated with trying to make progress." "We were keeping clean sheets 180 minutes ago and now we've conceded eight goals in two games." Slade's side are at home to Watford on 28 December before they turn their attention to the FA Cup and a home third round tie against Colchester on 2 January.